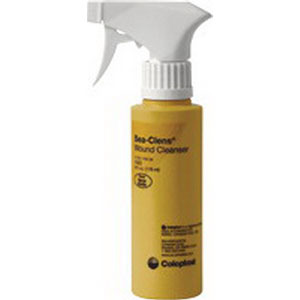 This Sea-Clens® is a cost-effective, saline based wound cleanser. Non-ionic solution delivers the benefits of pure saline. Adjustable with stream or spray delivery system. Assists in softening slough and Escher to facilitate debridement. Designed to loosen debris from the wound bed without interfering with healing process. Non-irritating to intact or damaged skin or mucosa. Cost-effective, saline-based wound cleanser designed to loosen debris from the wound bed without interfering with the healing process. Saline-based cleanser provides safe and effective irrigation. Soften Escher to facilitate debridement. Adjustable with stream or spray delivery system.